(Chris Detrick | The Salt Lake Tribune) Visitors take pictures and hike around Delicate Arch in Arches National Park Saturday, March 5, 2016. The rural residents of Grand County have rejected two initiatives in the past 14 years to restructure their government — a rare nonpartisan and part-time council that oversees a thriving redrock tourist destination. They won’t be able to stop the third. On the last day of this year’s session, the Utah Legislature passed a massive 89-page bill that, among a host of election policies meant to bring the state’s code up to date, requires counties to now adopt one of four approved forms of government. All of them have candidates run on party tickets. None of them is what Grand County currently has. 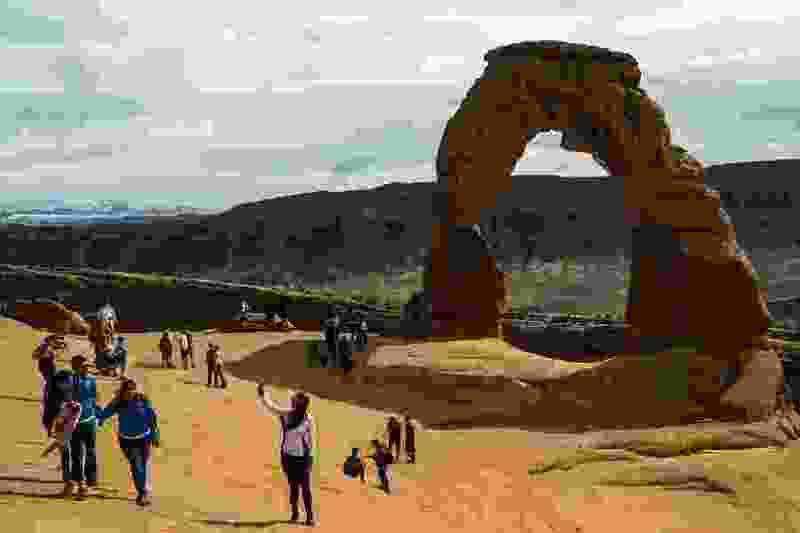 The change from HB224 has set off mounting angst in the desert community 200 miles southeast of Salt Lake City, a place where visitors twist their necks to see towering sandstone spires and most of the locals live at the gateway of Arches National Park. Grand County formed a seven-member council in 1992 with two at-large seats, recall elections and term limits — all practices that the state has since grandfathered. In 2004 and 2012, voters opposed efforts to change it. Still, by 2020, the new measure mandates, it must move to a three-person commission, an expanded five- to seven-member commission, a council with an elected mayor or a council with an appointed manager. And it must have partisan races. That was aggravated further when, hours after Utah Gov. Gary Herbert signed the bill March 15, five GOP residents filed an initiative to lead the process. Three have previously sat on the County Council. One is the current party chairman. Their proposal will ask the county’s 9,500 residents in November whether they want to form a study committee to research which form of government to adopt. If voters don’t approve the panel’s recommendation, the council defaults to a three-member partisan commission. “It looks like we’re going to be changing down here whether we want to or not,” said Lynn Jackson, one of the petitioners. He has lived in Moab for 28 years, served a term on the County Council starting in 2013 and favors moving to a commission. Because Jackson’s group filed the initiative, it will get to select one person to sit on the appointment council, which then will select the seven-member study committee. Grand County Democratic Party Chairman Kevin Walker fears that gives the GOP an unfair opportunity to tilt things in its favor. A smaller commission, too, Walker believes, would help Republicans to gain an easy majority on the body more than the current seven-member council, which switches from left-leaning to right-leaning depending on the cycle. The county has an unusual political dynamic compared with other rural — and mostly red — areas of the state. Grand is almost evenly split between liberal and conservative voters. In the 2016 presidential election, Republican Donald Trump took the county by just 0.3 percent over Democrat Hillary Clinton. Before that, residents chose GOP nominee Mitt Romney in 2012 (by one of his slimmest margins in the state) and Democrat Barack Obama in 2008. Certainly, there is animosity between the progressive environmentalists who have more recently moved to the area and the staunchly conservative ranchers who have lived there for generations. The groups have different visions for the county’s future, battling over whether it should be focused on tourism or mining. It’s gotten more heated with the change-of-government requirement. Mostly, HB224 has surprised residents and confused county leaders, launching even more debate over what form the county should choose, who can initiate the process and how to interpret the somewhat ambiguous bill. During a March meeting of the council, Grand County’s elected attorney, Andrew Fitzgerald, said because residents launched an initiative, leaders could not double up and pass their own resolution to put a study committee question on the ballot. A week later, his opinion had flipped. The competing analyses divided the council’s chairwoman, McGann, and vice chairman, Curtis Wells. Council members tabled the issue until the next week. They then passed their own ballot initiative 4-3 to ask voters about forming a study committee. They were met by a flood of comments from residents. “Whether we need a new government or not is a decision that’s up to the citizens,” argued Doug Fix, of Moab, who described the bill as a “heads we win, tails you lose” setup. State Rep. Gage Froerer, R-Huntsville, originally drafted HB224 after some residents wanted to explore a change of government in Weber County. It was meant to streamline the process for them. It had more far-reaching effects. Salt Lake, Summit and Wasatch counties all have legislative councils, too, but have either an executive mayor or manager at the head. Morgan County is the only other with a council, besides Grand, out of compliance that must adopt a new form by 2020. Its leadership has not discussed changes yet, and there has been little tension over it. The county also has nonpartisan seats, recall elections and term limits.